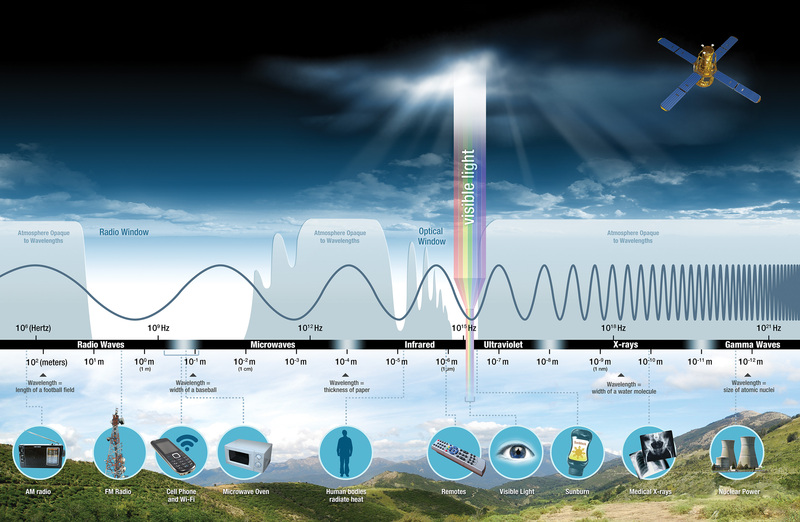 Gamma rays have the smallest wavelengths and the most energy of any wave in the electromagnetic spectrum. They are produced by the hottest and most energetic objects in the universe, such as neutron stars and pulsars, supernova explosions, and regions around black holes. On Earth, gamma waves are generated by nuclear explosions, lightning, and the less dramatic activity of radioactive decay. Unlike optical light and x-rays, gamma rays cannot be captured and reflected by mirrors. Gamma-ray wavelengths are so short that they can pass through the space within the atoms of a detector. Gamma-ray detectors typically contain densely packed crystal blocks. As gamma rays pass through, they collide with electrons in the crystal. 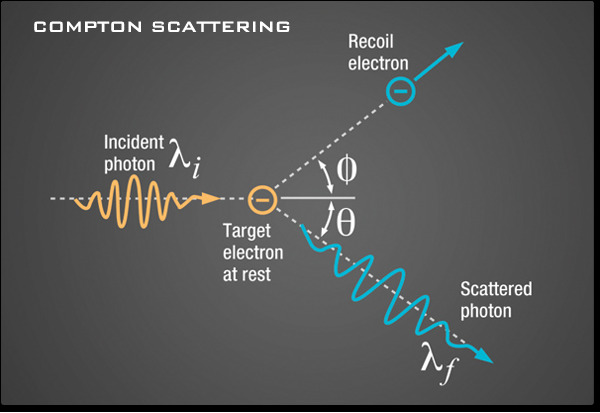 This process is called Compton scattering, wherein a gamma ray strikes an electron and loses energy, similar to what happens when a cue ball strikes an eight ball. These collisions create charged particles that can be detected by the sensor. Gamma-ray bursts are the most energetic and luminous electromagnetic events since the Big Bang and can release more energy in 10 seconds than our Sun will emit in its entire 10-billion-year expected lifetime! 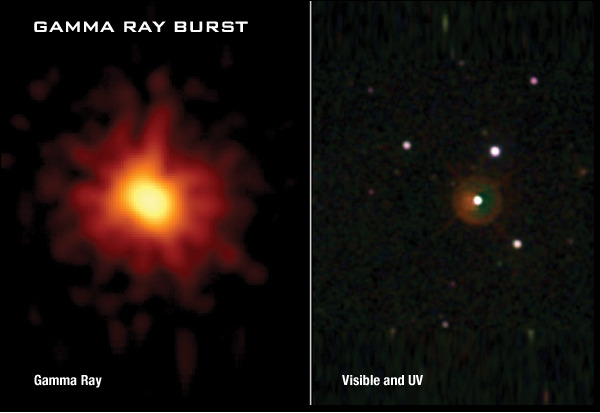 Gamma-ray astronomy presents unique opportunities to explore these exotic objects. By exploring the universe at these high energies, scientists can search for new physics, testing theories and performing experiments that are not possible in Earth-bound laboratories. If we could see gamma rays, the night sky would look strange and unfamiliar. The familiar view of constantly shining constellations would be replaced by ever-changing bursts of high-energy gamma radiation that last fractions of a second to minutes, popping like cosmic flashbulbs, momentarily dominating the gamma-ray sky and then fading. NASA's Swift satellite recorded the gamma-ray blast caused by a black hole being born 12.8 billion light years away (below). This object is among the most distant objects ever detected. Credit: NASA/Swift/Stefan Immler, et al. Scientists can use gamma rays to determine the elements on other planets. The Mercury Surface, Space Environment, Geochemistry, and Ranging (MESSENGER) Gamma-Ray Spectrometer (GRS) can measure gamma rays emitted by the nuclei of atoms on planet Mercury's surface that are struck by cosmic rays. When struck by cosmic rays, chemical elements in soils and rocks emit uniquely identifiable signatures of energy in the form of gamma rays. These data can help scientists look for geologically important elements such as hydrogen, magnesium, silicon, oxygen, iron, titanium, sodium, and calcium. 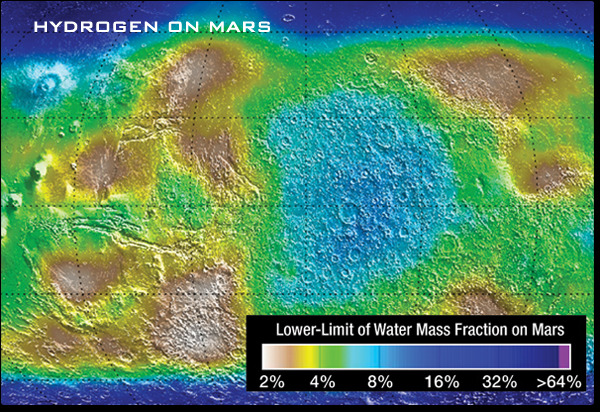 The gamma-ray spectrometer on NASA's Mars Odyssey Orbiter detects and maps these signatures, such as this map (below) showing hydrogen concentrations of Martian surface soils. Gamma rays also stream from stars, supernovas, pulsars, and black hole accretion disks to wash our sky with gamma-ray light. These gamma-ray streams were imaged using NASA's Fermi gamma-ray space telescope to map out the Milky Way galaxy by creating a full 360-degree view of the galaxy from our perspective here on Earth. The composite image below of the Cas A supernova remnant shows the full spectrum in one image. 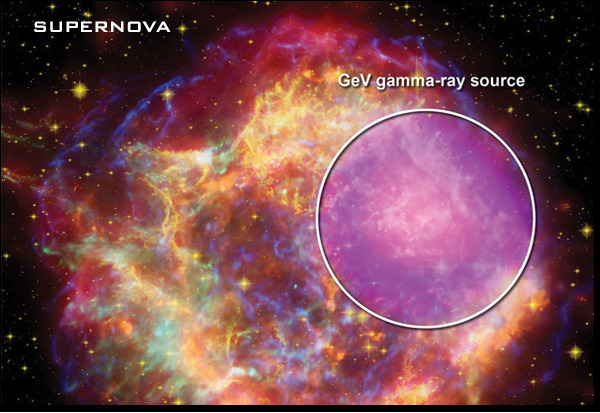 Gamma rays from Fermi are shown in magenta; x-rays from the Chandra Observatory are blue and green. The visible light data captured by the Hubble space telescope are displayed in yellow. 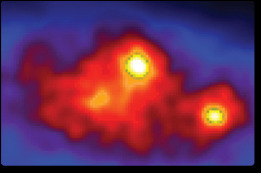 Infrared data from the Spitzer space telescope are shown in red; and radio data from the Very Large Array are displayed in orange.